Growing up as a kid in Croatia, meat wasn’t on the menu all that often, especially beef. We had fish from the river, our own chickens, eggs if the chooks were happy laying, if not you had to buy them from your neighbours providing they were willing to sell or barter for something you had an abundance of in your garden. Perhaps this may sound that things were on the scarce side, don’t get me wrong we ate well. We grew our own vegetables, as I mentioned earlier we had our own chooks, a few pigs, an orchard. 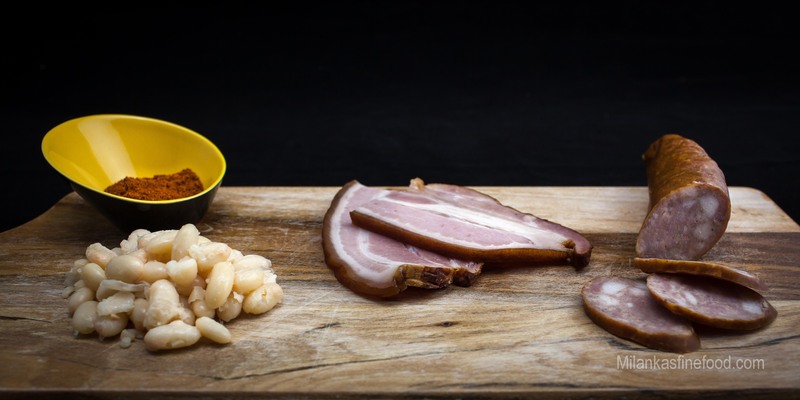 Vegetables and fruit were preserved for the cold winter, špek (speck), salami was smoked, sausages made and certain other meats preserved. This wonderful labour of love for growing, making, preserving and preparing good quality food provided us with a sound knowledge of what we were eating. There were no additives, preservatives and or other in any of our food. Often our dishes were simple however, always delicious and tasty. This little walk down memory lane from my childhood now brings me to a bean soup recipe which I would like to share. It is simple, hearty, healthy and boasts wonderful smokey flavours which take me back to cold winters, crusty bread and loving memories. Prepare the beans ahead of time by soaking overnight, cook the beans for 20 minutes or until soft. Strain and place in a bowl or container until you are ready to use them. In a large pot over medium heat, add oil, onion and sauté for a few minutes, reduce the heat, add the speck (špeck), garlic and continue to cook for another minute stirring, then the carrots cook for a further 4 minutes stirring. For the Roux, melt butter in a (separate) small pan, add the flour and cook stirring for a few minutes, until the mixture forms a smooth paste which leaves the sides and base of pan cleanly. The colour will change to slightly golden. Add the smoked paprika mix well to combine. The paprika needs only a little time on heat, it can burn quickly and loose the smokey flavour and aroma. Add the vegetable stock, roux, beans and bring to a gently boil and allow to simmer for 40 minutes. A few minutes before you turn the heat off, add the kransky sausages to give them time to warm through. Turn the heat off and you are ready to serve. A lovely crusty bread would accompany this hearty soup. There are many varieties of smoked meats and sausages available that would be suitable for this dish. Feel free to experiment and select what appeals to you. I have selected the white beans for this for their delicate distinctive flavour. They are high in protein, low in fat, high in fiber, minerals and vitamins. In a few months I will share another bean soup recipe with you, using borlotti beans. Okay, I know this will be a family favorite. 🙂 Croatia always holds a special spot in my heart after I worked on EU youth employment projects in Dubrovnik. It’s always fun to cook a meal from the region that I love, and explain to family and friends just how beautiful Dalmatia is. This brings back memories of chilly Balkan winters – this was (and is!) one of my all time favorite soups <3 Bravo!